Many of Emory's schools and departments are among the top ten nationally ranked in NIH funding according to the annual Blue Ridge Institute for Medical Research report. Research grants from the National Institutes of Health (NIH) held by Winship Cancer Institute investigators and other Emory faculty have led to high national rankings of many of Emory's schools and departments among their peer units, according to the annual Blue Ridge Institute for Medical Research report. The Nell Hodgson Woodruff School of Nursing is ranked number one in the nation in NIH funding among all nursing schools for the first time ever. In addition, Emory's Department of Pathology (third), Department of Pediatrics (fourth), Department of Radiation Oncology (sixth), Department of Microbiology (sixth), Department of Surgery (eighth) and Rollins School of Public Health (ninth) were all highly ranked nationally in NIH funding in comparison to their peer units. 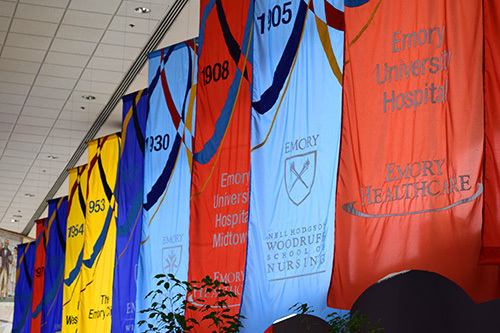 "These high rankings of many of our schools and departments speak to the outstanding research being conducted all across the Emory University campus," says Walter J. Curran, Jr., MD, executive director of Winship. "Congratulations to all who participate in and support the research that has led to this recognition."